A constituent assembly or constitutional assembly is a body or assembly of popularly elected representatives composed for the purpose of drafting or adopting a constitutional-type document. The constituent assembly is a subset of a constitutional convention elected entirely by popular vote; that is, all constituent assemblies are constitutional conventions, but a constitutional convention is not necessarily a constituent assembly. As the fundamental document constituting a state, a constitution cannot normally be modified or amended by the state's normal legislative procedures; instead a constitutional convention or a constituent assembly, the rules for which are normally laid down in the constitution, must be set up. A constituent assembly is usually set up for its specific purpose, which it carries out in a relatively short time, after which the assembly is dissolved. A constituent assembly is a form of representative democracy. Constitutions arise in a number of different ways. At the non-democratic extreme of the spectrum, we may imagine a sovereign lawgiver laying down the constitution for all later generations. At the democratic extreme, we may imagine a constituent assembly elected by universal suffrage for the sole task of writing a new constitution. And there are all sorts of intermediate arrangements. Right after the 1948 Costa Rican Civil War that overthrow Rafael Angel Calderón Government, the leaders of the victorious side call for an election of a Constituent Assembly in the same year. The Assembly successfully drafted and approved the current Costa Rican Constitution. The Danish Constituent Assembly established the Constitution of Denmark in 1849. During the French Revolution (from July 1789 to September 1791) a National Constituent Assembly (Assemblée nationale constituante) was formed when representatives assembled at the only location available – a tennis court – and swore the Tennis Court Oath on June 20, 1789, promising that they would not adjourn until they had drafted a new constitution for France. Louis XVI recognized the validity of the National Constituent Assembly on June 27, 1789. On 27 November 2010, Iceland held an election for a constitutional assembly, with 522 people vying for 25 delegate seats. The constitutional assembly, in session for four months from early April until late July 2011, drafted a new constitution and passed it unanimously with 25 votes against zero with no abstentions. Parliament put the bill to a national referendum 20 October 2012 in which 67% of the voters declared their support for the bill. Further, 67% of the voters declared their support for equal voting rights (one person, one vote) and 83% declared their support for national ownership of natural resources, two key provisions of the bill. Parliament has failed to ratify the bill, however, inviting accusations that the political class is trying to thwart the will of the people by disrespecting the result of the 2012 constitutional referendum. The Constitutional Assembly of Indonesia was established to draw up a permanent constitution. Its membership was elected in November 1955, and it met for the first time in November 1956. After four sessions, it failed to agree on the fundamental basis for the state. It was dissolved in 1959, and the original constitution imposed by presidential decree. The Constituent Assembly of Italy was established in 1946 in the wake of Fascist Italy's defeat during World War II. It was elected with universal suffrage, simultaneously with a referendum about the adoption of Republic or the continuation of monarchy. Voters chose Republic, and the new assembly had the task to approve the new republic governments, as well as to write a new constitution. This was approved on 22 December 1947. It was dissolved on 31 January 1948, to be replaced by the new Parliament of Italy. Nepal has had two Constituent assemblies, the current one being elected after its predecessor failed to deliver a constitution, despite multiple extensions. It also serves as the country's parliament. Finally Nepal had made constitution with 89% majority. Nepal is adopting Federal states soon. The Russian Constituent Assembly was established in Russia in the wake of the October Revolution of 1917 to form a new constitution after the overthrow of the Russian Provisional Government. The Sri Lankan Parliament approved the creation of a Sri Lankan Constitutional Assembly on March 9, 2016 proposed by Prime Minister Ranil Wickramasinghe. The assembly will draft a new constitution for Sri Lanka. Constituent Assembly of Turkey was established in 1961 after the 1960 Turkish coup d'état to prepare a democratic constitution. The constitution was prepared and approved by the voters in a referendum of 1961. The U.S. 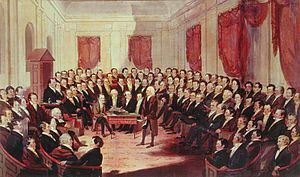 Constitutional Convention that drafted the still-current United States Constitution in 1787 was notably not a constituent assembly: its delegates were appointed by the states, not directly elected, and not all states sent delegates; moreover, the Convention was originally charged with drafting amendments to the Articles of Confederation rather than a new constitution. The US Constitution contains no provision for its own replacement, so any constituent assembly would necessarily be extra-constitutional. Article V of the Constitution does permit Congress to appoint a national constitutional convention to propose amendments but has never done so. While Congress has the option to submit both its own proposals for amendments and those of a national convention to state conventions rather than the state legislatures for ratification; this process has been used only once (for the Twenty-first Amendment). Neither of these would necessarily be constituent assemblies, as there is no provision requiring that such bodies be elected rather than appointed by the existing legislature. The Virginia Constitutional Convention, 1830 (George Catlin, ca. 1830). Many state constituent assemblies, like the 1830 Virginia Constitutional Convention, were highly formalized but the legitimacy of the constitution they drafted depended on whether it was authorized by the people, not whether a particular procedure was followed. A tradition in the use of constituent assemblies exists at the state level of Constitutionalism. In fact, constituent assemblies met in the states before the formation of the Federal Constitution in 1787 as well as after its ratification. Since 1776 nearly 150 state constitutional conventions have met to draft or revise state constitutions. These early state constitutional conventions frequently did not use procedural steps like popular ratification that became commonplace in the mid-19th century. Yet they were considered to be constituent assemblies that exercised their authority as that of the people. As American Sovereigns: The People and America's Constitutional Tradition Before the Civil War by Christian G. Fritz notes:. "A legitimate constitution depended on whether the sovereign people authorized it, not whether a particular procedure was used or whether revolutionary conventions were free of other responsibilities, such as passing ordinary legislation. It was the people as the sovereign who authorized drafting those first [state] constitutions that gave them their legitimacy, not whether they used procedures that matched what was later understood to be necessary to create fundamental law." American state constituent assemblies in the 19th and 20th centuries reflected many qualities of a citizen's movement. From the start of state American constitution-making, delegates to constitutional conventions studied earlier state models of constitutions. They often self-consciously "borrow[ed]" constitutional text and provisions from other states. They often used in their drafting and debates compact and pocket-sized compilations of all the existing American constitutions, so that the constituent's assembly could draw upon the latest in constitutional design. A few countries do not have an entrenched constitution which can be amended by normal legislative procedures; the United Kingdom, New Zealand and Israel are examples. In these countries there is no need to call constituent assemblies, and no provision to do so, as the legislature can effectively modify the constitution. If such a country decides to implement a constitution, presumably some sort of constituent assembly will have to be set up for the purpose. The constitution of New Zealand consists of a collection of statutes (Acts of Parliament), Treaties, Orders-in-Council, Letters patent, decisions of the Courts and unwritten constitutional conventions. Because it is not supreme law, the constitution is comparatively easy to reform, requiring only a majority of Members of Parliament to amend it. The constitutional law of Israel is determined by the Knesset which, since 1949, serves as the country's ongoing constituent assembly. The Knesset has the power to create Basic Laws of Israel, laws which are entrenched legislation and will become part of a "future" constitution of Israel, as well as "regular" statutory legislation. ^ "Resolution on Constitutional Assembly passed in Parliament". www.adaderana.lk. Retrieved 19 March 2018. ^ See The Records of the Federal Convention of 1787 (Edited by Max Farrand; revised edition in Four Volumes, Yale University Press, 1966). ^ Albert L. Sturm, "The Development of American State Constitutions," 12 Publius (1982), 57-98. ^ Laura J. Scalia, The Remaking of State Constitutions: The Uses of Liberalism in Designing Electoral Laws, 1820-1850 (Northern Illinois Univ. Press, 1999); John J. Dinan, The American State Constitutional Tradition (Univ. Press of Kansas, 2006). ^ Marsha L. Baum and Christian G. Fritz, "American Constitution-Making: The Neglected State Constitutional Sources," 27 Hastings Constitutional Law Quarterly (2000), 199–242.